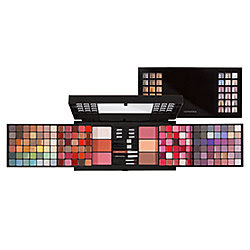 Best of all, it's limited-edition and completely out of stock on Sephora's website, so this is your last chance to find this amazing palette without spending a bundle on Ebay! Entering is easy. Simply enter your name and email address in the box below. The winner will be selected on Saturday, January 10 and notified by email. It's that simple! This giveaway is open to US residents only. Giveaway runs until Friday, January 9 at midnight. One entry per person, email address and IP address. Multiple entries will be disqualified. No box shows up for me, but I'd like to enter if it ever does. I mean, it shows up, but it's just a blank white box. my sister got my niece a smaller version of this kit for x-mas - i begged my niece all day to trade for one of my gifts - she said no! it really has everything you need - the only make-up you will need to buy for the year!! lol! good luck everyone! This looks like an awesome make-up kit. Thanks for the great opportunity!